Well the title today says it all. This is just an office building covered with modern paintings in the form of boxes, where orange and red are predominant, clearly visible if you are walking anywhere near the intersection of Diagonal Avenue, Aribau and Londres streets. To be more precise the right address is Londres 106. The boxes are symmetrically displayed on the façade from street level till the highest floors of the building. I added an Indian summer effect to the background to make the paintings stand out a little bit but the colors in the boxes are real. Caramba, está mais que visto que tenho mesmo de conhecer Barcelona! Nice page Carlos, I would be glad if you were interested in having a look at http://budapestdailyreview.com/dailyphotos and tell your opinion as well. Cheers. Excelente imagem, muito bem conseguido e muito bem feito. Awwww this is a beautiful, beautiful picture! I was born and raised in Barcelona, but have been living in the Los Angeles area for many years. I just adore your blog. Me encanta ver las bellisimas fotos de mi añorada ciudad. Moltes gracies i visca Barcelona!!!! 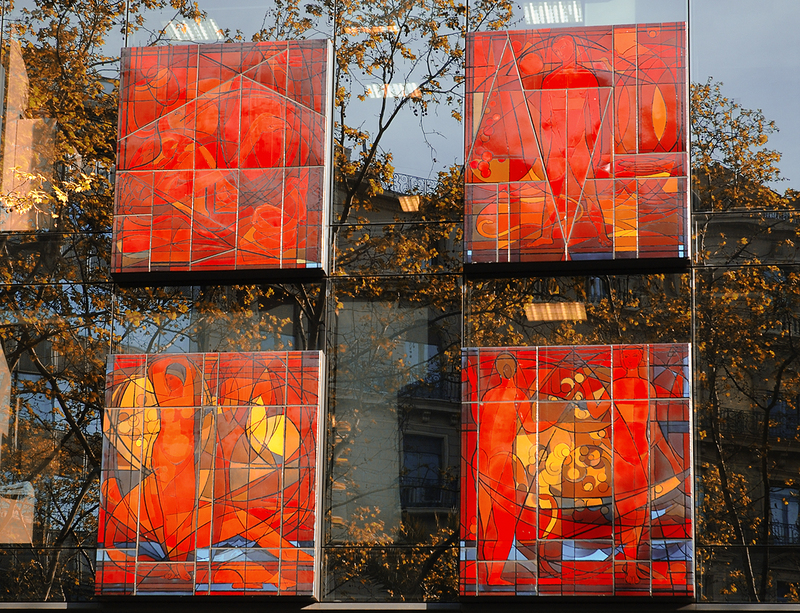 Woow thats... amazing bright red tiles on reflective glass, i wonder how it would look at night?? Do you know what office is this or who is the architect? Thanks everyone. Bash, I know it is an office building but I don't know about the artist. Sorry.